My friend's brother got married last weekend. 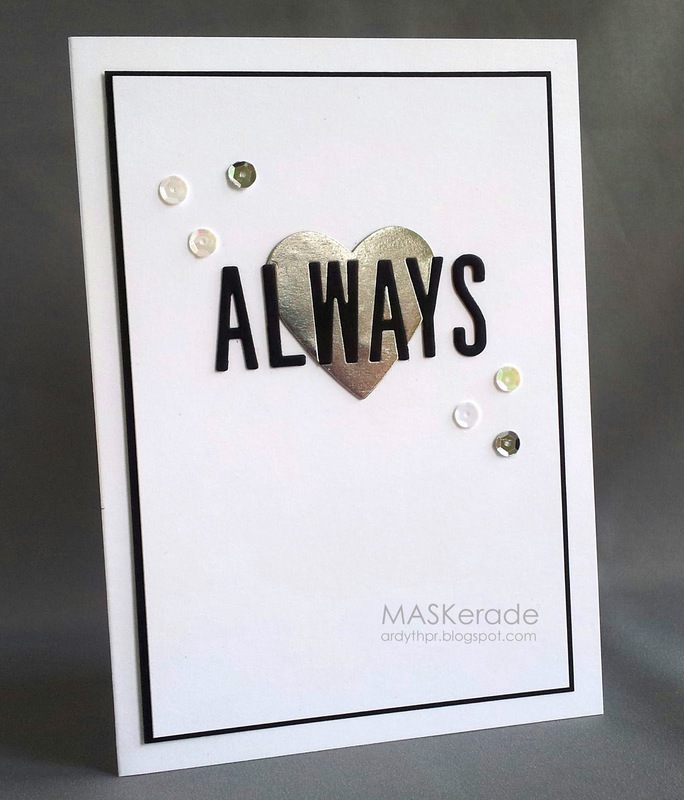 She asked me to make a card for them, in their colour scheme of black, white and silver. They're pretty young, so I decided to go sleek and modern. I started with a stacked heart in a silver foil paper that I think looks almost like stainless steel. I inlaid the 'lway', and added the 'a' and 's' outside. The trickiest bit of this was the spacing of the letters, so I lined the dies up on my graph paper and then picked them up with masking tape to keep them properly spaced when I cut them out of the heart. Wow! This card is amazing! And it's beautiful! Struan is pretty amazing, too! 15 and going away to get his gliding licence. Fantastic! Does he have long to wait until he's 16? Hope the gliding training goes swimmingly! It is truly amazing what our kids can accomplish. I'd be a nervous wreck too for Struan but oh so proud as you are Ardyth. Your wedding card is fabulous. Your card is stunning and so sophisticated looking! Perfect modern design for the wedding card Ardyth! Classy and cool - great for a wedding! Oh, this is so elegant. I loved the perfectly executed inlaid technique. Be still my speedy beating 'chrome' lovin' heart! The inlaid letters are beyond brilliant! Yep - Darnell called it...a masterpiece for sure! Fabulous card and yes, very sleek and modern, I love it! And gliding class...oh my, I would be such a nervous nelly. Good for Struan, you must be so proud. Very cool design, and great tip on how to keep your letters evenly spaced. You are a brave mom to let your son learn to glide. It's in the air, right?